The origins and philosophy behind the SNAG® Coaching System are not new to sports, only to golf. The golf world has maintained a credo for all players new to the game that they learn the game, practice the game, then play the game. SNAG® allows new learners to play the game, practice what is learned and then play some more. We do not recommend starting on the golf course but rather on a SNAG® course designed for the beginning player. Golf is one of the few games where the equipment used by beginners is exactly the same as the equipment used by professionals. 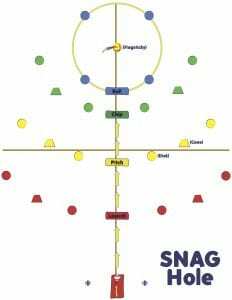 The SNAG® Coaching System uses specially designed equipment that helps the beginner progress through the learning curve faster and more effectively. You will see a greater level of success from all players using this equipment over standard golf equipment. Cycling uses training wheels on a smooth, flat surface, not the Tour de France. Snow skiing uses short, wide skis on a bunny slope, not racing skis on the triple black diamond. Baseball starts with a tee-ball concept and small fields,not a 95 mph fastball in major league parks. Yet we start all golfers with professional equipment on the same venues where professional tournaments could be held. This coaching system addresses how and where beginners should start within the context of your local public park or other facility. The SNAG® Coaching System utilizes the “Whole-Part­ Whole Teaching Method.” It involves the demonstration of the whole skill first, and then the breakdown of the skill into its parts so it can be seen, understood and executed properly by the player.Each part is described by a phrase or word picture and assigned a word cue.When word cues are given in their proper sequence,the player is able to recall the descriptive phrase or mental image and can work on his or her own to practice the skill. By performing specific tasks outlined inthe SNAG® Coaching System, new learners develop correct golf motor skills. The system contains five creative training tools (pictured to the left) that will enhance their progress. It is important to note that most of us are visual learners and respond positively when instructions are not mechanical, but fun. Another unique quality of the game allows the new learner to begin play in a familiar environment where shot distances are relative to everyday life. This smaller, more focused environment eliminates most of the fear and intimidation that a regulation golf course implies.It also provides a better overall picture of a course environment to help build the new learner ‘s confidence and reinforce his or her successes. The system recommends sessions of instructional and repetitious skill development that coincides with sessions of immediate play. By enabling this initial “play component”, new learners are able to better understand the skill sets they require, and are then motivated to develop and practice those skill sets during the instructional sessions. A systemic approach to teaching new golfers the “fun”damentals of golf. Utilizes a multi-station and play. 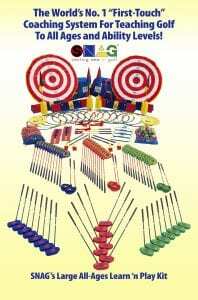 Incorporates the “how and where” each shot is played. 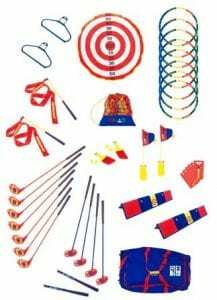 Includes the use of training tools to “build” proper motor skills. Strong safety and class management techniques. Designed for ALL new learners. Heavy focus on new learner self-correction. Can be taught indoors or outdoors. Class sizes from 1 to 32. 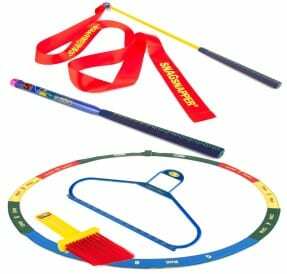 Utilizes stations to teach the various strokes and swings. Provides a safe environment for all new learners. Easily controlled and managed by the instructor. More relaxed and fun learning environment for beginners. Coaching kits are designed to teach large groups. Small kits can typically be used to instruct 8 to 16 learners at one time, and the large kits can accommodate 16 to 32 learners at one time. These kits can come with programming for various environments such as: school PE curriculum, golf camps, multi-sport camps, recreational leagues in the parks, active adults programs, youth golf programs and adult or women’s programs. A Scoring Zones Kit focuses on “where” to play based on distance. Many people understand “how” to do the shots but they don’t understand which shot to make “where” distance wise. Scoring Zones provide the visual stimuli needed to learn which shot to make based upon distance to the green. Instead of just aiming in a direction and hoping the ball will get close, using Scoring Zones you are actually able to target based upon a visual that illustrates distance. This assists the players is developing greater touch through arm control and makes playing the game less intimidating. Scoring Zones contain SNAG-A-Green™, Spots, Large Arrows, and Connectors. The SNAG-A-Green™ is a portable outline of a golf green. The Flagsticky Target resides in it when it is set up. With the SNAG-A-Green™ the coach is able to set up a course anywhere! 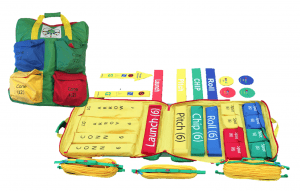 The Spots follow the same color coordination as all other SNAG® products so it is a seamless and consistent learning system for the player: Roll is Blue; Chip is Green; Pitch is Yellow & Launch is Red.